Responding to a Microsoft License Review Request (Deployment Summary) by using ATFIRST | rakusol asia pte. ltd.
※ Provide contact details of your company, partner, and the contact person. Fill out the total number of Client Devices currently used in your organization. Fill out the number of Desktop, Notebook PC, Tablet, Thin-Client, and PDA you own regardless of whether Microsoft operating system(Windows OS) is installed or not. Please do not include the number of servers in this section. The number of Thin-clients which do not run software on its own. The number of Netbooks which are smaller notebooks in terms of size, weight, and capability, and specialized for internet browsing use. Fill out the total number of server devices currently used in your organization. please do not include client devices in this section. Please record any other company name under which Volume License software may have been acquired over the last 4-5 years. Please record all physical addresses that your organization may have occupied over the past 4-5 years, This will ensure all Microsoft licensing records are taken into account. If your organization purchases Microsoft Volume License software under a parent company’s agreement, Please provide details. If your organization is a current member of the Microsoft Partner Network, Can you please specify what form of Partner status is held also if you subscribe to any addition partner offerings, Please confirm which subscriptions are held. ① Click “License Dictionary” from Admin menu. 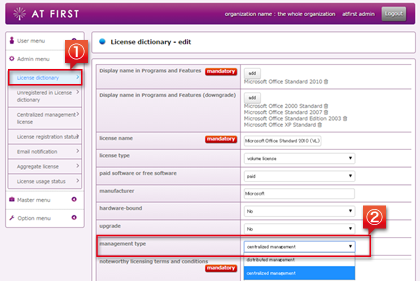 ② Set the management type field to “centralized management” in the License dictionary – edit screen. Selecting “centralized management” reduces operator’s time and effort for input work. ③ Click “Centralized management license” from Admin menu. 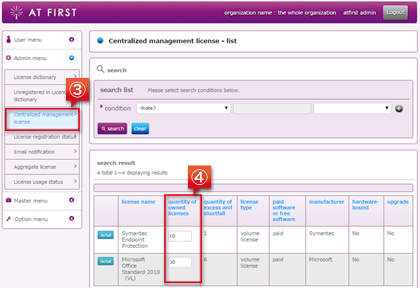 ④ Input the “quantity of owned licenses” in the Centralized management license – list screen. ⑤ Click “License registration” from User menu. 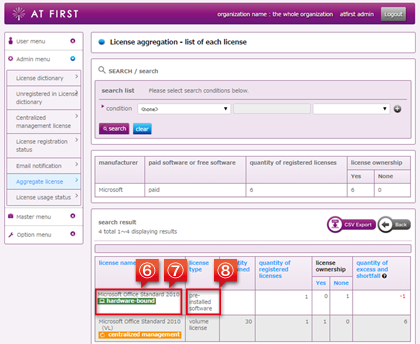 ⑥ Search on “license registration” is equal to “candidate (paid) with the search condition in the Installed software – list screen. ⑦ Register the licenses with candidate(paid), and input corresponding product keys in the license remarks field. 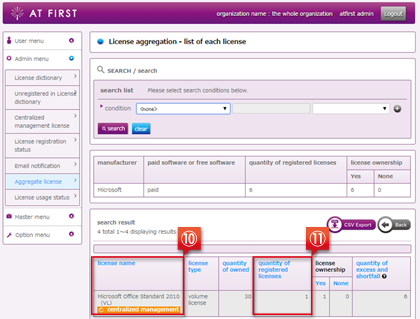 Note: licenses which “centralized management” is set in the License dictionary will not be displayed in the Installed software – list screen. ⑧ Click “License registration status” from Admin menu. ⑨ Search on “license unregistered (candidate(paid))” is “more(after) with the search condition. ⑩ Instruct users to register licenses until “license unregistered(candidate(paid))” becomes “0”. ① Click “License registration” from User menu. ② Export hardware information as a CSV file and aggregate it by each OS using pivot table or the like in the License registration – hardware list screen. 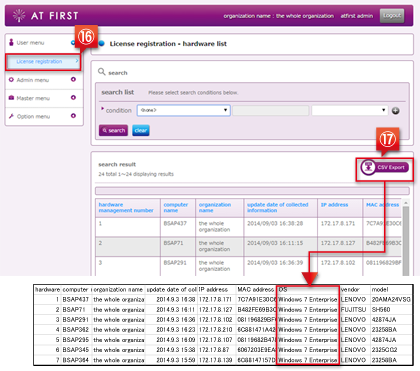 ③ IWith the aggregation result of each OS, verify the corresponding product and version in Deployment Summary. ④ Fill out the Qty. of the corresponding product and version from the aggregation result of each OS. When the aggregation results came up with “OS：Windows XP Professional” in CSV. 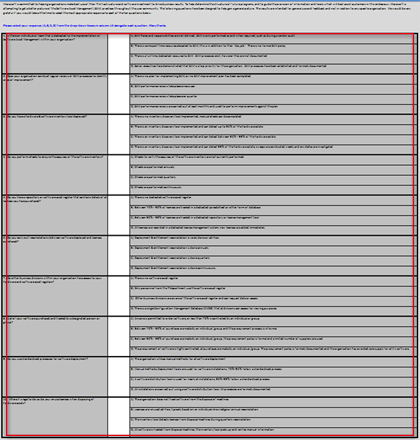 => In Deployment Summary, fill out the “Qty.” of “XP”, “Professional”. In this Section, fill out the quantity of each version of Microsoft’s products currently installed or in use regardless of the type of license. ⑤ Click “Aggregate license”from Admin menu. ⑥ Select “manufacturer, paid/free software ” option in switch display. 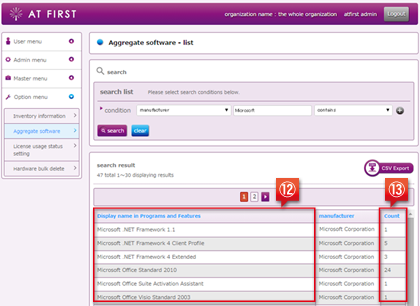 ⑦ Select or type “Manufacture”, “Microsoft” and “contains” in search condition. ⑨ Select and Click “Microsoft”, “paid” row from the search result. 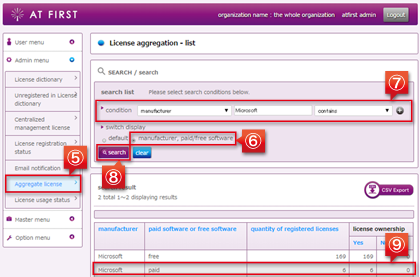 ⑩ In “License aggregation – list of each license” screen, verify “license name” field. And find out the product name and its version in Deployment Summary corresponding to the license name. ⑪ Fill out Qty. in Deployment Summary from “quantity of registered licenses” field in ATFIRST. 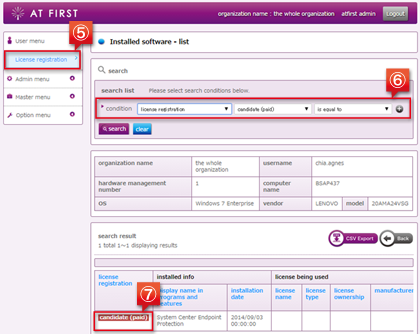 ※ If installed software products are not listed in SECTION 4.2, go to SECTION 4.6 and fill out the other products. 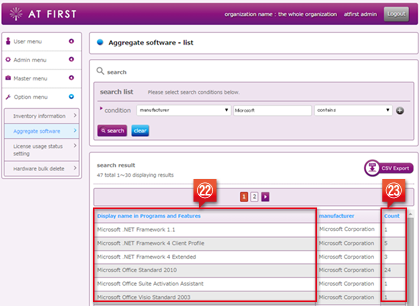 ⑫ In “Aggregate software – list” screen, verify installed Developer Tools in “license name” field. ⑬ Fill out Qty. 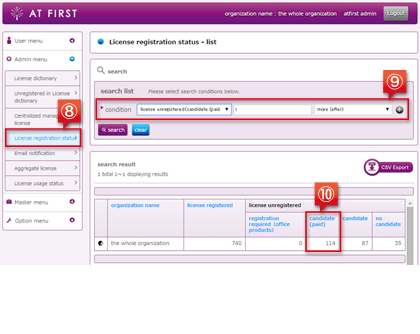 in Deployment Summary from “quantity of registered licenses” field in ATFIRST. ⑭ Fill out how your company licenses “Developer Tools”. ⑮ Fill out the number of developers your company has. If the installed quantity of Developer Tools and the number of developers are different, specify the status and fill out the blank. All of them use Visual Studio Standard 2008. One of them uses Visual Studio 2010 Ultimate with MSDN, and the other one uses Visual Studio Test Professional 2010 with MSDN. ⑯ Click “License registration” from User menu. ⑰ Export hardware information as a CSV file and aggregate it by each OS using pivot table or the like in the License registration hardware list screen. ⑱ With the aggregation result of each OS, verify the corresponding product and version in Deployment Summary. ⑲ Fill out the Qty. of the corresponding product and version from the aggregation result of each OS. ⑳ Verify which of the product and version in Deployment Summary is corresponding to “Client Access License” that your company　currently owns. ㉑ Fill out the “Qty.” with the quantity of Client Access License. ※ The licenses in this screen are different from the examples used in explanation. ㉒ In “Aggregate software – list” screen, verify the former part of the license name just before the edition part, and fill out “Product” field in Deployment Summary. ㉓ Verify the edition part of the license name, and fill out “Version” field in Deployment Summary. ㉔ Fill out Qty. 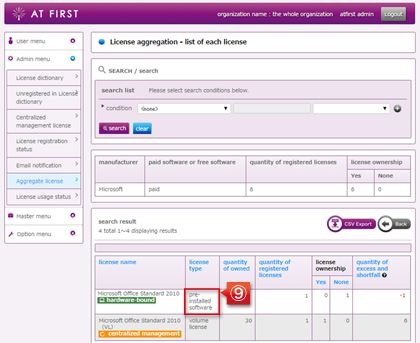 from the quantity displayed in “quantity of registered licenses” in “License aggregation – list of each license ” screen. Answer Yes/No question if any version of Windows Terminal server is used. Fill out “Application”, “Version”, and “Qty.” fields if any Microsoft applications installed on the Terminal server for use. Example: Office Professional 2010 – 50 users. As for the No. of Devices with access to application, fill out the number of PCs access to the Terminal server. Fill out the principal uses of SQL server if it is used within your environment. Briefly describe if Virtual Server is used within your environment, regardless of whether the Microsoft Virtual Server product is used or not. Fill out this section if Office SharePoint Server(MOSS) is used within your environment.Regarding the total number of devices/users, please break them down into internal or external if it is accessed by external suppliers/customers. Fill out this section if your organization is currently using Online Services(Could) such as Office 365. Also answer Yes/No question if your organization is considering using the Online Services. 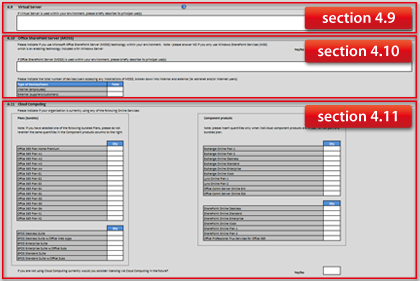 This section is used to fill out any licensing that has been purchased outside of the Volume licensing programs. Product keys are needed to fill out “Qty.” field. This will not require the product key for all of your licenses. Provide 5 product keys for each version and edition of the products. ① Click “Aggregate license” from Admin menu. ② Select “manufacturer, paid/free software ” option in switch display. ③ Select or type “Manufacture”, “Microsoft”, “contains” in search condition. ⑤ Select and Click “Microsoft”, “paid” row from the search result. ⑥ In “License aggregation – list of each license ” screen, verify the former part of the license name just before the edition part, and fill out “Product” field in Deployment Summary. ⑦ Verify the latter part of the license name just after the edition part, and fill out “Product” field in Deployment Summary. ⑧ Fill out “License Type” in Deployment Summary from the “license type” field in “License aggregation– list of each license ” screen. ⑨ Fill out Comment / Description column if there is anything you want to specify (for memorandum use). ⑩ Verify “license type”, and select the corresponding Proof of Purchase from the table below, and fill out “Proof of Purchase Held” field with it. 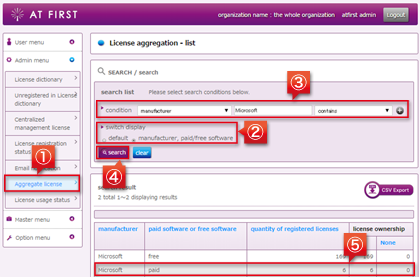 ⑪ Fill out the quantity of “license ownership Yes” field in “ATFIRST　License aggregation – list of each license” screen. ⑫ From this “License aggregation – hardware detail” screen, fill out the five “Product Key” that you entered in “license remarks” field. NOTE: The license remarks field should be filled out with “product key” when users register a program license. This SECTION is a questionnaire from Microsoft which is designed to gain a general picture of SAM (software asset management) in your organization. Select your answer(A, B, C, D) from the drop-down box for each question. Is there an individual or team that is dedicated to the implementation of Software Asset Management within your organization? Does your organization conduct regular review of SAM processes to identify areas of improvement? Do you have a hardware and software inventory tool deployed? Do you perform checks to ensure the accuracy of software inventory? 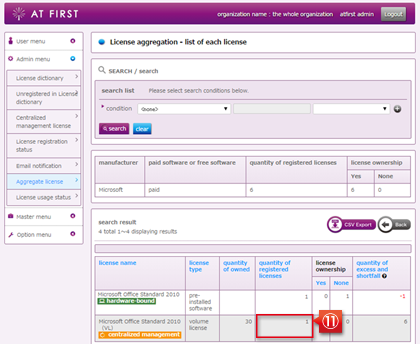 Do you have a repository of software asset register that contains details of all licenses you have purchased? Do other business divisions within your organization have access to your hardware and software asset registers? 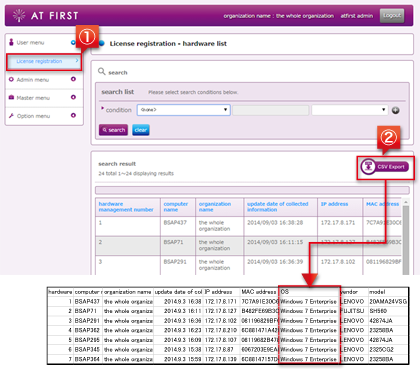 Is all of your software purchased and tracked by a designated person or group? Do you use standardized processes for software development? Where it is legal to do so do you re-use licenses when disposing of hardware assets?